For oil, the focus continues to be mainly on the supply side of the equation rather than demand. Although concerns over demand have come into sharper focus again, owing to further weakness in economic data, ultimately, though, Saudi Arabia and co. in the OPEC+ group of producers want higher oil prices and to achieve that they continue to restrict supply of the stuff to artificially boost prices. At the same time, we have seen in the US two unexpected drops in oil inventories in as many weeks and a decline in drilling activity over the past few months. US (shale) oil production may be levelling off, in other words. So, we are likely to see further consolidation and side-ways trading in oil for a while unless demand concerns deepen further, especially from places like China and other emerging market economies. 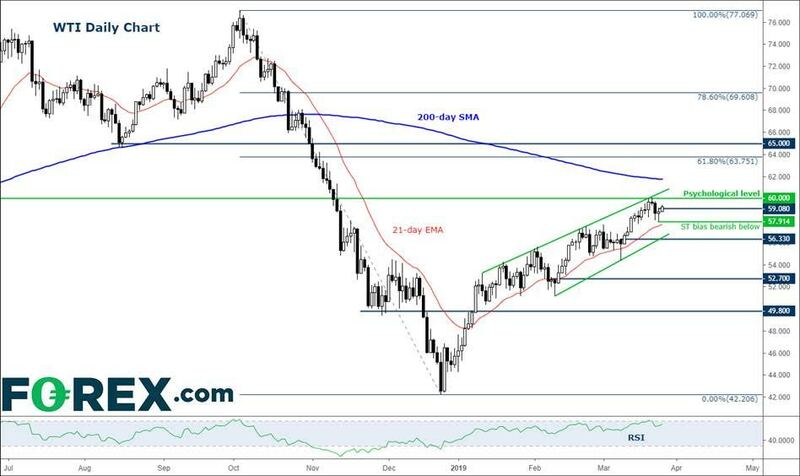 From a technical point of view, we are watching price action closely after WTI created two doji/small hammer candlestick patterns in three days – one at just above the $60 hurdle on Thursday of last week when it hit a fresh high for the year at $60.37, and the other yesterday around the $58 level. Depending on which of these patterns prove to be the correct signal, we could potentially see a sharp move in the direction of the break. So, a potential break below Monday's low would be a short-term bearish development while a move above last week's high would keep the bulls in charge.